GREEN BAY, Wi. Area – An early Saturday morning car trip to Northeast Wisconsin was rewarded with a taste of some fascinating wines made with cold climate grapes. From Madison, the trip to the region just south of Green Bay is about two-and-a-half hours. I started the day at LedgeStone Vineyards in Greenleaf. 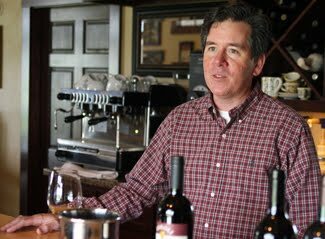 Tim Abel has strong opinions that Wisconsin’s wine future is the native cold weather grapes like LaCrescent, Frontenac, Marquette, Frontenac Gris, Edelweiss, La Crosse, St. Pepin, and Swenson Red. These cold-weather grapes were the work of University of Minnesota’s Horticultural Research Center’s Elmer Swenson. I had heard about Frontenac before my two-day Wisconsin visit but had never tasted the wine. I’ll unabashedly admit I became a fan after tasting the grape in several different styles during my Saturday wine stops. 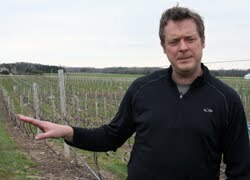 Abel has a modest operation with limited vineyards, but he’s growing all cold climate grapes. He buys some fruit and even uses his tasting room as a bit of a retail outlet for wines of the world. My first-ever sip of Frontenac was Tim’s 2008 Frontenac Reserve, grown in the LedgeStone Vineyard. The bone-dry red wine has really nice acid and a tart black cherry flavor I’ve not had in any red wine before. LedgeStone also offers a Rose of Frontenac that had a little more pronounced fruit and even bigger tartness. I loved it. 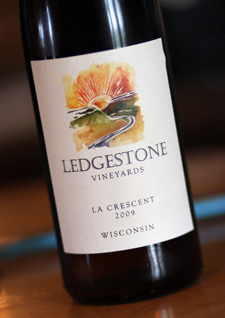 My first taste of LaCrescent, a white varietal, was equally impressive. The wine had lemon and apricot flavors, a long finish, and big acidity. But the wine was well balanced. LedgeStone has a little higher price point than the other three visits. Tim’s Reserve is $28 at full retail while the LaCrescent is $22. A stop an awesome cheese shop not far from Greenleaf split my two winery visits. I bought some artisan Wisconsin cheese at Nala’s Fromagerie. Great stuff! See photos from my Saturday stops here. Then it was off to visit Steve Johnson and Maria Milano at Parallel 44. 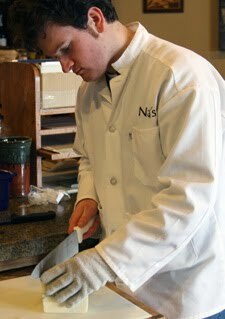 The winery is a handful of miles off the Lake Michigan coast near Kewaunee. It is a Tuscan-themed winery that sets down a county road with a 10-acre vineyard out back. The two are former lawyers taking their case to the consumer wine court with the cold varietal grapes. Steve was more outspoken than any of the other three winemakers about getting these unique wines outside the state. He sees the state’s future resting on the unique varietals and growth outside of Wisconsin. Parallel 44’s Glacier White was a nice grapefruit flavored, crisp white wine made from Swenson and LaCrosse grapes. It was quite dry with pronounced acidity, but still balanced for $18. The winery’s $13 Tundra White is a combination of Frontenac Gris and La Crescent that was semi-sweet with some peach and honey hints. It’s easy to see new wine consumers scooping this one up. And being so close to Green Bay, Steve and Maria had to have fun with the region’s cultural history. Yes, they have a wine called “Frozen Tundra!” The iconic moniker most associated with the Green Bay Packer’s Lambeau Field becomes a Frontenac Rose at the winery. The wine is a big seller with sweet cherry and a nice tartness. I tasted a few other wines and did some extensive interviews. I’ll be doing an over-all story about Wisconsin wine for Palate Press in the coming weeks. I’ll also have a newspaper column or two about this visit and more for the blog. Here’s a little shout out to Becky Rochester at the Wisconsin Grape Marketing Coordinator for the Wisconsin Grape Grower’s Association. She helped arrange my visits and shared a lot of helpful information. Also, I will post a big photo album from both day’s visit Sunday or Monday – so check back!